I was tempted to bake this cake as I usually do for this type, in cupcakes cases. But as I wanted to have a variation also I chose a classical cake rectangular shape. But it would have turned out for sure as great in round cupcake cases. This cake is extremely easy to make. 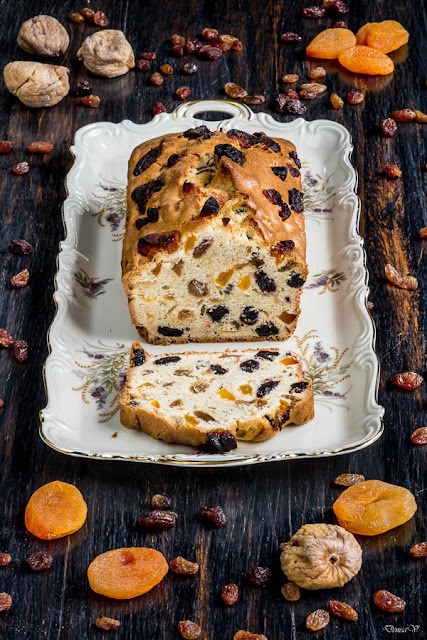 It takes you more work to cut the dried fruits more than the preparation of the rest of the cake. And as you can use any fruits you have available, if you chose small dried berries or raisins you exclude the cutting work as well. The cake is having very little additional sugar. Dried fruits are coming with their own sugars and flavor. It might look like a Christmas cake but you can match it perfectly for any breakfast with a cup of tea. Put all the dried fruits together with the rum. Mix them and let them macerate for 30 minutes. Mix all ingredients with a standing mixer and add the fruits and the rum in the end. Mix again until well combined. Bake the cake in the preheated oven at 200ºC for 45 minutes. Let it cool in the pan before taking it out. Recipe inspired from Marmiton les meilleures recettes de pâtisserie et desserts de Marmiton, page 50.